The silver leaves of ‘White Nancy’ spotted deadnettle, a perennial, soften the bold pink colors from tuberous begonia and tropical-looking angel wings. I have a friend who always bemoans the fact that her property doesn’t get much sun. I would pity her so-called plight if it were true; on the contrary, I find her backyard to be an enticing collection of glossy-leaved evergreen shrubs, lacy ferns and flowing forest grasses with an unquestionable zen sensibility. 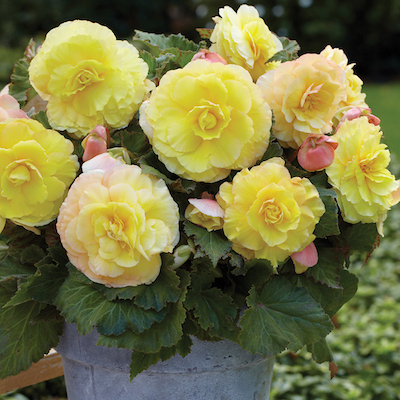 ‘Strawberries and Cream’ tuberous begonia produces fully double, giant blooms that will easily brighten a shady garden. My sun-craving fellow gardener could hire someone to remove the “offending” tall trees overshadowing her property but she knows that’s not practical, not to mention she would be killing some stately specimens for purely selfish reasons. Despite all her complaints, I know she would miss the meditative mood her shady space evokes. I’ve come to the conclusion that my friend doesn’t need more sun; instead, she needs to embrace her garden’s unique light attributes. Why? The shade garden is all about texture, foliage and contrast. You can get pops of color by carefully planning your beds, “but you also have to accept that a shade garden is not going to be flashy and colorful,” Ms. Draper said. Variegated Solomon’s seal is an attractive, low-maintenance addition to the shade garden that tolerates a range of light and soil conditions. For shade dwellers intent on raising carnations, daisies or any other sun-loving plants, consider growing them in containers and siting them in the sunniest spot of the garden — if one exists. Unfortunately, that site may not be in a convenient location, which is why it’s best to work with the light you have, which could be vastly different from one area to another — shades of shade, if you will. The I’Conia series of begonias (‘Miss Montreal’ shown here) features masses of vibrant flowers for a season-long display. • Dappled, which is created by tall and small-leaved trees and changes depending on the season and the sun’s position. • Open, which occurs from a north-facing building or wall (plants get about three to four hours of shade per day). • Medium, which is open shade further obscured by trees (plants get about four to six hours of shade daily). • Dense (full shade), which is found under trees with dense foliage and where tall walls and fences block out all but the narrowest strips of light. • Dry, which often occurs under trees, many of which are shallow rooted, making it difficult to plant. This shade can be challenging to work with because shallow-rooted trees are water and nutrient hogs, making it difficult for other plants to thrive. Japanese forest grass ‘Aureola’ practically shimmers in the dappled shade. Knowing what kind of shade you have is important when you have a light-challenged garden. Before you purchase any plants, read the care labels, paying special attention to light requirements, described as either full or partial sun or shade. Next, consider your soil. After you have amended your garden beds, it’s time to pick your plants. Ms. Draper cited several of her organization’s Perennial Plant of the Year® Program winners as superb choices for shade. In 1990, the PPA launched that program to showcase perennials that are standouts among their competitors. The 2013 winner, Polygonatum odoratum ‘Variegatum’ (Solomon’s seal), features beautiful foliage and dangling white flowers. At the Smithsonian Institution, Ms. Draper cares for this plant beneath surface-rooted American elm trees. 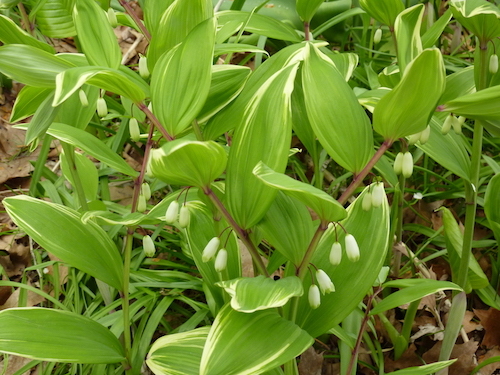 “Many plants will not be able to contend with root competition, but the Polygonatum does it without hesitation,” she said. 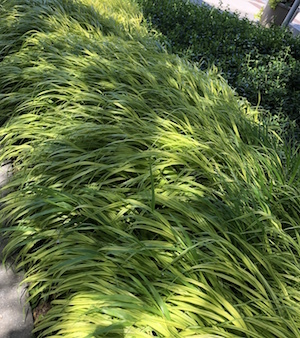 She also recommends a 2009 winner, Hakonechloa macra ‘Aureola,’ a golden Japanese forest grass, which has a graceful, flowing look that brightens up any dark area. As for infusing color into the shade garden, that’s where annuals really shine. 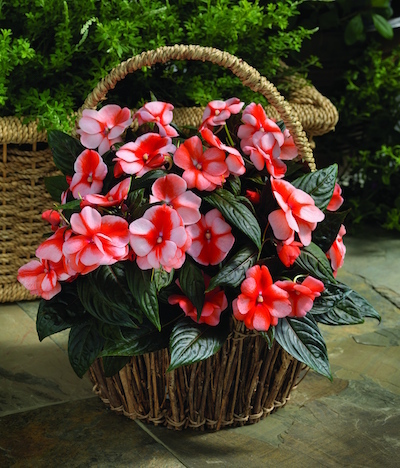 Florific™ Sweet Orange New Guinea Impatiens thrives in partial to full shade, producing stunning. bicolored flowers in shades of light salmon to deep orange. 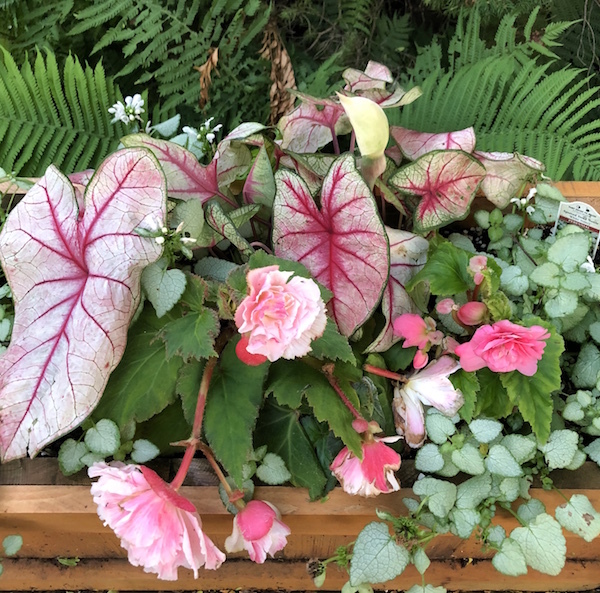 Begonia x tuberhybrida (tuberous begonia), which comes in a broad range of colors and features huge blooms, and Impatiens, especially Bounce™ Pink Flame ‘Balboufink,’ work especially well, as does tropical-looking Caladium, also known as angel wings. Still think you don’t have many choices for your shady space? With a little research, you can design a garden so magnificent that it would put those on the sunny side of the street directly in the shade. 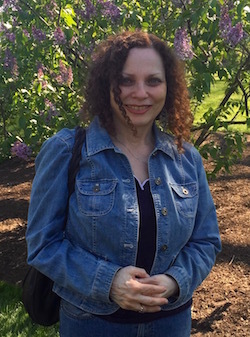 Susan Tito is a freelance writer and proprietor of Summerland Garden Design & Consulting She earned a certificate in ornamental garden design from the New York Botanical Garden and is a member of the American Horticultural Society and Garden Writers Association. She can be reached at stito630@gmail.com or you can visit her website at summerlandgardendesign.com.